The main track is the Soundtrack of your video. It can be a Video (such as a video presenter) or an Audio Soundtrack. Drag and drop a video track from the right panel, or add an audio file by pressing in the 3 dots option. If you are editing a video with a presenter the main track will automatically be the audio from the video. 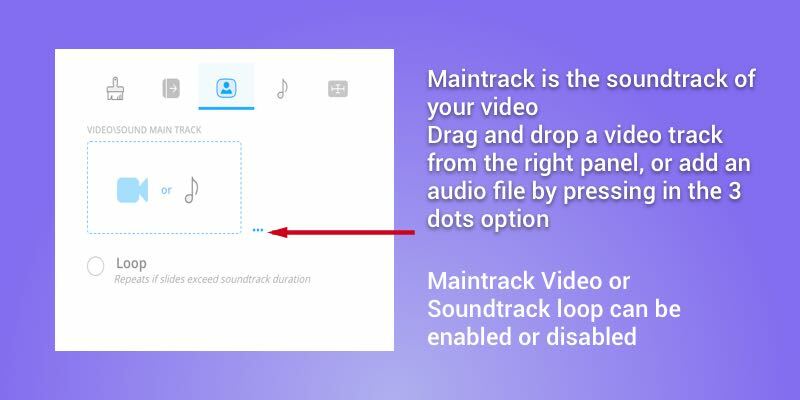 Loop - maintrack audio will loop if slides exceed soundtrack duration (if you are experiencing an unwanted loop at the end of the video make sure this feature is off).